Home > Causes of Hair Loss > Can Hair Care Products Cause Hair Loss? When you're already worried about losing your hair, the last thing you want is for the products you use to care for it to do it harm. Unfortunately this can happen all too easily, but it can also be avoided if you choose products carefully, understand your unique needs and act quickly should things start to go wrong. One of the most common ways that hair products can cause hair loss is because they exacerbate existing damage when wrongly chosen. If you are already concerned about hair loss, you shouldn't settle for just any bottle of shampoo or conditioner. You should hesitate to try new products just because they worked for a friend or an advert says they can help with hair loss. What matters is getting the right product for you. They key to this is understanding your hair type. If you're not confident about this, you can ask your hairdresser. Some hair loss conditions can make your hair dry and brittle. Fine hair and afro hair are particularly vulnerable to this, and if you wash them with products designed for oily (or even 'normal') hair, you can make the problem much worse. This can lead to hair breaking off close the roots. Naturally oily hair might not seem as vulnerable, but if you treat it with products designed for dry hair you can cause a build-up of oils on the scalp, even if you wash it frequently. This can lead to infections like dandruff and can cause severe itching which, if you scratch, can mean hair follicles are damaged. Oil build-up can also suffocate follicles directly. If you can't find a suitable shampoo and conditioner, it's often better to wash oily hair with plain water. Even if you choose products carefully, anybody can suffer an allergy, and this can happen even with a product you've been using for a long time. Unfortunately it's not something you can avoid by choosing natural products as these can also cause problems. Some people are even allergic to hypo-allergenic products! The best way to avoid allergy-triggered hair loss is to be alert to changes in the way your scalp feels. Most scalp allergies cause similar symptoms. You may experience a stinging, itchy sensation, or the surface of your scalp may feel spongy when you touch it. Hair often becomes loose when this happens, so it's easily tugged out, but the follicles will usually recover if you are quick to stop using the problem product. 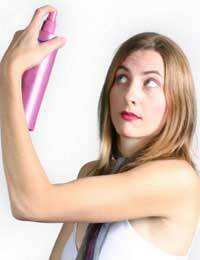 If you have a problem with dry, brittle hair or if your hair is thinning, hair spray can be a bad idea. Many sprays make the hair more likely to break, whilst even gentler sprays can add to its weight and position it at an unusual angle that puts more extra stress on ailing follicles. Fortunately, mousse or gel is much kinder to hair and can provide an alternative styling solution. If you have longish hair which is going thin on top, it's best to use products like these only on the portion of your hair that rests directly on the scalp. It will come as no surprise that bleach can damage your hair, but what isn't always clear is that there is simply no way to prevent this. Using products designed for bleached hair can help to coat individual hairs with protective oils and decrease wear and tear, but they will still be more fragile and vulnerable to breakage than unbleached hair. Many people bleach their hair as it thins because the bleaching process expands hair and makes it look bigger, but this effect comes at a high price. It is particularly problematic for long or tightly bound hairstyles. Don't be fooled by products that claim they can bleach your hair kindly – all they can do is provide a small amount of compensation for the damage bleach does. Even if it doesn't contain bleach, hair dye can cause hair loss. This is because some dyes – especially dark ones and those with a reddish hue – contain chemicals called paraphenylendiamenes which distress the immune system. In some cases these can trigger severe allergic reactions. Because their effect on the body is cumulative, using such a dye over a long period of time often results in irritation, damaging follicles and causing hair to fall out. If you are experiencing hair loss, check through the hair products you use to assess whether they could be contributing to the problem. Your hair loss might be very easy to reduce.